Very early last Thursday morning, at about 2:00 a.m., I saw my garden from a whole new perspective. I was wheeled out, backwards, on a gurney. Joe decided to call the ambulance when I told him that I felt pressure on my chest and had difficulty breathing. As a heart patient with 13 stents, that is definitely a scary feeling. 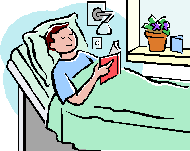 The good news in all this is that I am feeling better, although I am still in the hospital. My heart is strong, but the doctors do not understand how my healthy liver produced enough enzymes to prevent my blood from coagulating. So I am closely monitored and feeling antsy. Joe brought up the laptop, and here I sit. Writing. It’s been kind of strange the past few days, to be in this hospital room and not be able to walk around the garden, upload photos, update this blog, and visit the sites of so many people I have met through this exercise. How have I passed the time, you ask? Each time I turn on the tv in my room, it goes to the Relaxation Channel. It’s a lot of new age music and footage of nature and seasons. Flowers blooming. Leaves blowing and changing colors. Water rippling. The first snowflakes falling. This did nothing to relax me. In fact, it reminded me of a scene from the classic sci-fi film Soylent Green, which takes place in a future, over-populated, over-polluted America and where green has nothing to do with gardening. In one scene, Edward G. Robinson checks himself into a euthanasia clinic, where he is placed on a bed and shown images similar to those on the Relaxation Channel as he sleeps into the sweet hereafter. Not something I should be watching from my hospital bed! I then turn to the Food Network, becoming hooked on the show “Chopped.” If you’re not familiar with this show, it’s like a “Beat the Clock” for chefs. They must prepare an appetizer, an entree, and a dessert — all using surprise ingredients — for a panel of celebrity chefs. I am glad the nurse is not taking my blood pressure when the host yells, “Chefs, one minute remains” and they have not even begun to plate. Again, not something to watch a lot of as I recuperate. So I change the channel to HGTV — usually watching “House Hunters International,” mostly because I like looking at the gardens of the properties up for sale — which reminds me, what happened to the “G” in HGTV? The channel is full of decorating and home buying shows — but what about the outside? There is “Yard Crashers,” but that has way too much banter and ends up not telling me enough. (Although, I must admit, I was intrigued by the weather station that attaches to your roof and regulates your in-ground sprinkler.) One of my favorite shows from HGTV-past was “A Gardener’s Diary,” in which host Erica Glasener introduced viewers to gardeners and their gardens. As she and the guest strolled through the garden, it was personal, informative, and passionate. That’s the calming effect I need. Ultimately, I found gardening Zen in two places. The first is an article in today’s New York Times. It tells the story of Ed Toth, who works for the New York City Parks Department. He’s on a seed-gathering mission of native New Yorker grasses and wildflowers. Fascinating stuff, and a mission that is truly admirable and necessary. My second meditative moment is a video e-mailed to me by my dear friend Maria. The Life of Flowers reminds us of the wonders of gardening and the ensuing peace — much if it the result of what we do not see. And it’s what we do not see, from liver enzymes to buds bursting open, that can make all the difference. Hello, wishing you a speedy recovery! Thank you! By the way, I stopped by your site — the photos of those unfurling swords are great! Very prehistoric. I agree, the garden is where you find the r & r you need; get well soon! Jayne, thanks for the well wishes — and here’s to getting that much needed r&r! Cheers! How I wish you lived close by!!! When I’m back on my feet — and when things are blooming — I’ll try out some new angles in the garden. Just for you. Thanks for the well wishes. Thank you so much for your get well wishes. Soon . . . I hope you get well soon, and are out of that sterile hospital environment asap! I read with interest your perspective on television. Never heard of the relaxation channel, but the soylent green image surely is not one a hospital should be promoting. Alas, there is no G in HGTV anymore. You would think that, with the movement toward more organic gardening, they could find a small organic farm or self-sufficient family to showcase. I bet this bit of “reality tv” would be less costly than giving yard makeovers every week! Hope you’re back to your garden soon. I can’t wait to get home! I also think that if we all put our heads together (and if the “G” programmers paid attention), we could give them a week of shows. 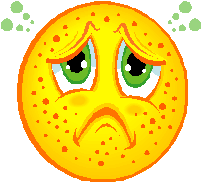 Kevin – it’s your favorite secretary – now banished to Howitt – haven’t been on site in a couple of months and something nagged at me to go on today – what happened!!!!!!!!! Hope you’re feeling better soon – miss you and love you. I’ll fill you in — there’s not enough space to write out the whole ordeal — but things are looking up. Wow, I don’t have cable and look at all that I am missing. I think I would pick all the same shows but would also have to be in a hospital bed to get me to stay put. I am sorry that’s where you are and hope you vacate and return to the garden soon. It is astounding how many “reality” shows are on all of these channels. Today, I got wrapped in a cake show — amazing. Thanks for the get well wishes! Sorry to hear you’re in hospital but glad you are doing well. Relaxation channel? wow, so much we’re missing here with our ‘country cable’, I’ve never heard of this before. I have to agree that walking in the garden is a wonderful way to relax for me but next best thing when the weather is chilly, as it is quickly becoming, is to make garden plans for the next season. Pencil and paper are my friends these days as I dream about next years garden. Take care and get well. I think the Relaxation Channel is a hospital thing. As for me, I agree with you: paper, pencil, plans — and piles and piles of seed catalogs. Now that’s a fun night! I’m brand new to your blog Kevin. I’m going to spend some time on it this evening. Just want to wish you a speedy and full recovery. There is something so very healing about nature, the out of doors and one’s own garden. I hope you can get out into to it soon. Erin, I’m thrilled that you found me, and I hope you enjoy as you explore the site. I think you may be onto something with a garden blogging blitz to HGTV programming. Stay tuned! My goodness, that must have been very frightening! Get well soon! Hope you have a speedy recovery and are back in the garden soon!! Thanks so much! I’m looking forward to that moment as well. I just found your blog through Blotanical. I hope you’re better, and back in the garden very soon! Personally I love chopped. Sometimes with the ingredients they’re given it’s a miracle they can create something edible! 😉 Hope the food isn’t too bad where you are. Thank you for finding me. I’m doing much better — and I agree, it is amazing what they create from the ingredients in the basket. Cheers! p.s. I hope the canna and elephant’s ears aren’t responsible for your current situation. Thrilled to have you on board! I’m feeling much better. Thanks for visiting. Hey Kev…didn’t get a chance to really talk to you since you’ve been back. So glad you’re feeling better. Don’t scare us like that! 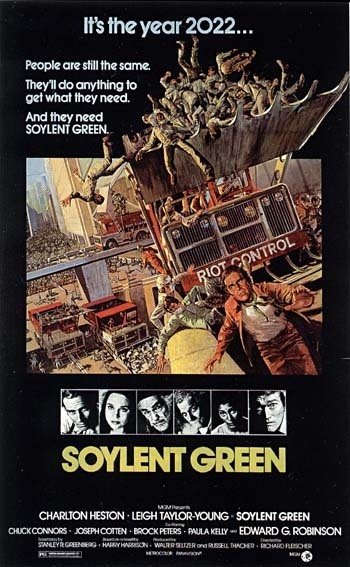 I’m happily surprised that I’m not the only person I know who has seen Soylent Green.